I understood that quite a few of the cars used were secondhand? I certainly don't think they bought 30 NEW ones. If you look carefully at the garage scene where they are putting the fake gold into the cars, you can see one of the original number plates lying around on a stack of wheels (NOC 76F) and against the roof pillar next to the white mini. (32:27). At this point the blue and red cars are both wearing 'film' registrations red OEG 103G and blue WGH 415G (with standard wheels). Both are twin tank cars in this scene. The 'film' registrations are easy to spot because they are on pressed plates where the originals are on separate raised silver on black plates. The black Jag appears to have its original registration as well here 619 DXX. The red mini that is crashed into the bricks on the ramp is wearing the OEG 103G registration (not the same car, it has only one tank) and has the light bar with the three cibies and a Morris Cooper grille. (33:25) This looks to be a pre-65 car because it has no safety bosses under the door handles and chrome window catches with no no badges on the back. It has had a blow over because the rear quarter window frames are body colour and there is overspray everywhere. Single pod instrument cluster inside and looks to have the high seat belt hole in the B pillar. In the same scene the blue car WGH 415G has now got the minilites and bonnet straps. It has Austin Cooper S badges and a grille modified to take the three lamp bar but no bar and does appear to have a two tone seat chrome door trim, S brakes and possibly an oil cooler, so is likely an S. It is not one of the 'star' cars because it has a radio aerial on the drivers wing. Passenger door hinges appear to have 1/4 bolts instead of pins, maybe to hold the door closed? ...good observation..i noticed the same as undoubtedly a few of the scenes in the film especially pre Turin stages S types are not used.. The three that went over the cliff were just single tank 850 Minis. The white one was was repainted from red, probably just a shagged out early car bought for peanuts - the red car that gets pranged early on in practice is such a car. I believe the E-type Jag (848 CRY) is still around. 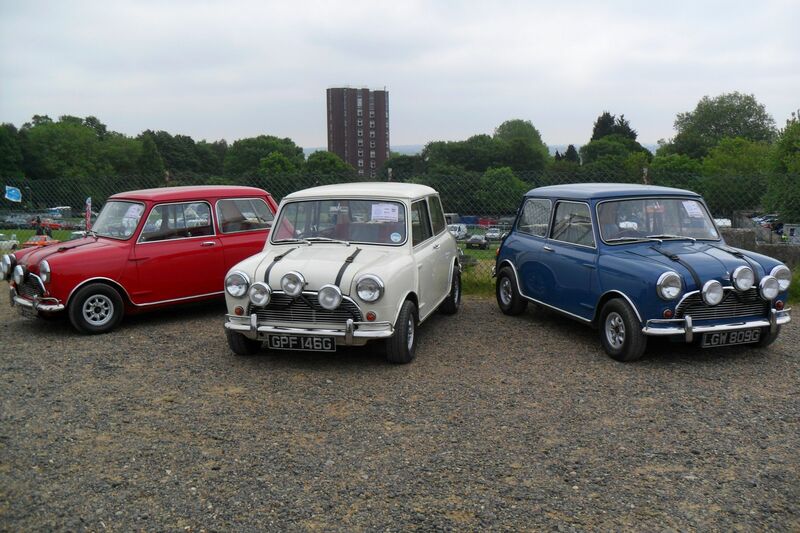 It was on the Italian job charity run when i last did it. Crystal Palace the location of the explosion of the post office van in the Italian Job......photos now and then (and starting point of the annual London to Brighton Mini Run). 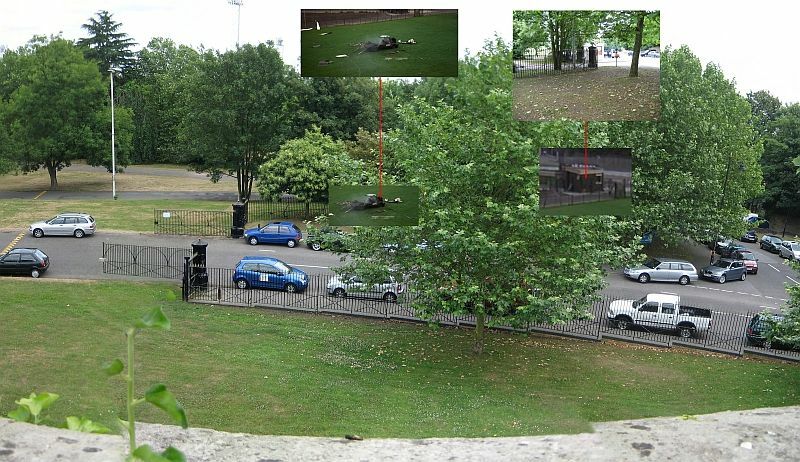 They watch from the foot of the television transmitter mast at Crystal Palace Park as the white van, parked on a small green patch by the park's Canada Gates entrance, is blown to smithereens, and "You're only supposed to blow the bloody doors off!" enters the lexicon of classic movie quotes. 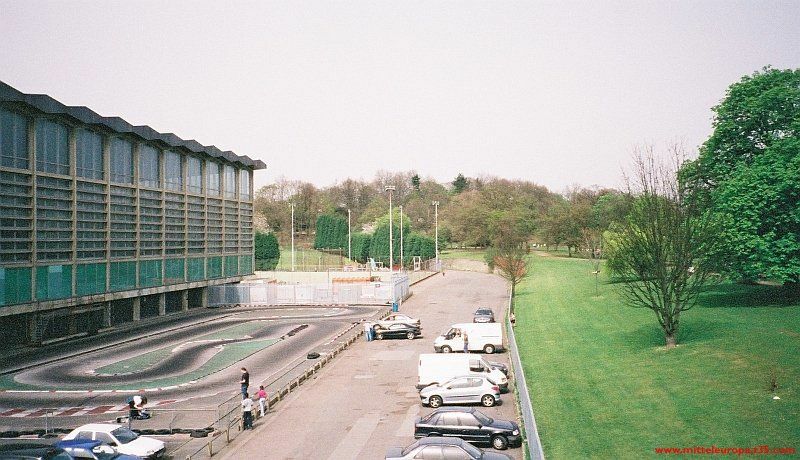 In the above photographs, the remains of the old Crystal Palace motor racing circuit, showing the section used by the Italian Job Mini Coopers to practice jumping. This section of the circuit was also used for the parade lap start of the 25th London to Brighton Mini Run in 2010. Last edited by mab01uk on Fri Mar 15, 2019 9:15 pm, edited 3 times in total. The number plate certainly is! I've mentioned this before about those number plates. They were auctioned by the DVLA back in March 2003, selling for a total of £9,300. David Morton purchased the plates a few years later.